Reading this book was a pleasure. I thoroughly enjoyed it – it made me happy and it encouraged me to carry on with my drawing. It’s not an instruction book, but it’s full of insight into what happens when you draw and it’s dotted throughout with personal information, such as how Marr began drawing, like most of us at school, what he drew, and how he lingered over drawings and paintings, going to exhibitions such as those at the Royal Scottish Academy. He draws most days. 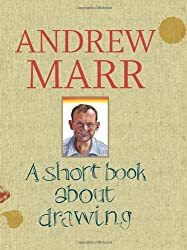 This book was written not long before Marr suffered a stroke and it was only after he found himself drawing again – on his iPad – that he began to feel himself again. I would have liked more details about his drawings, about the medium he used – some are obviously digital, and others are pencil sketches, but others are less obvious, maybe pen and wash? … the real drawing craze spreads from small numbers of enthusiasts to the new middle classes. A Short Book About Drawing is a special book. I thoroughly recommend it. Oddly, I didn’t know Marr was a Scot. I like the sound of this book very much. I loved art at school and wasn’t bad at it but have not done any since apart from embroidery if you can count that. (Probably not.) I’ve started to become interested in art and art galleries over the past few years though. No accounting for it but perhaps it comes with old age. LOL. I’ll look for this in the library. Glad you enjoyed it so much. I know what you mean, Cath, with some people you never think whether they are Scots, English or whatever and as I said it was only when I finished and read the back cover that I thought – oh yes he is a Scot! I hope your library has a copy – mine does, but I like it so much I think I’ll get my own copy. Catherine Russell liked this on Facebook. David Freeman liked this on Facebook. Margaret – How interesting! I’d never thought of myself at all as someone with artistic ability or who was very much into drawing. And yet, there is definitely something to his arguments. Thanks for sharing. Margot, I think his premise is that we all have artistic ability – we just need to use it. I never thought I could, but friends persuaded me to join the local art group and it’s great fun and I’ve actually produced some pictures that aren’t too bad at all – even if I say so myself. It sounds interesting and I’ll definitely be picking this one up when I see it. I was supposed to be good at art at school but never thought so myself, maybe it will encourage me to do something beyond needlework. It’s fascinating Katrina. I was useless at art at school, so I’m sure you’ll be very good! Have a go.